We had a dinner with our son and his wife not too long ago at a restaurant that we have been to before, because of logistics, between the two homes. We met at the Lakes Bar & Grille in Commerce, Michigan. The name of the restaurant does not do it justice. It sounds like a neighborhood bar with some burgers, and while it does have both of those features there is so much more to be had. It is a very comfortable and nicely decorated eatery that has so much more to offer then mere burgers, though there are times when a burger is just what the doctor ordered. We had some diverse dishes that evening. Our son actually had a fancy burger, while his wife had a dish they she enjoyed the last time we were there, a dish that had a layer of sirloin tips, with a layer of macaroni and cheese topped with lobster, I have to admit that I had the same dish last time we were there and I did think of repeating it, it was so good. My Bride is so healthy, she ordered a Caesar Salad with Salmon, and I am sure that is was very good, but there is no way I could order a Caesar Salad as an entrée, when she makes the best dressing I have ever had. As for myself I decided to order the Smoked Barbecue Spareribs, since the menu touted that the meat falls off the bone, and that is the way I like them. I am an old fuss-budget I guess, because the last thing I want to do when I go out for dinner is to pick up a bone and gnaw on it, it just doesn’t seem appropriate out in public; and ribs are very easy to eat with a knife and fork. Then the four of us shared in a Salted Caramel dessert. The wine list at the restaurant is not huge, but it is ample for the food that they serve, of course our son and his wife, unfortunately do not enjoy wine as much as my Bride and I do. He was trying some of the craft-beers that they offered, which is all the rage, while his wife enjoyed soft drinks. 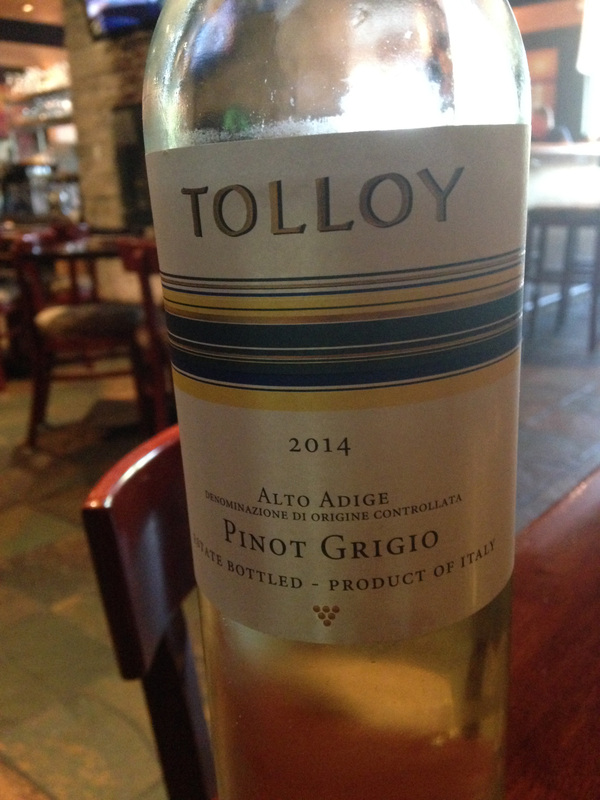 When we first got there to cool off from the summer heat and I am not going to complain of the heat, after the winter we just had, we enjoyed some glasses of Tolloy Pinot Grigio DOC 2014 from the Alto Adige or the South Tyrol of Italy. On a hot day, I just find that a glass of Pinot Grigio is light enough to just enjoy and it doesn’t have to be fussy, as I am hoping that the wines later will be. My Bride bless her enjoys wine with a salad, and I just can’t do it, as I find that the dressings usually compete with the wine, so if I have a salad course I just prefer a glass of water. 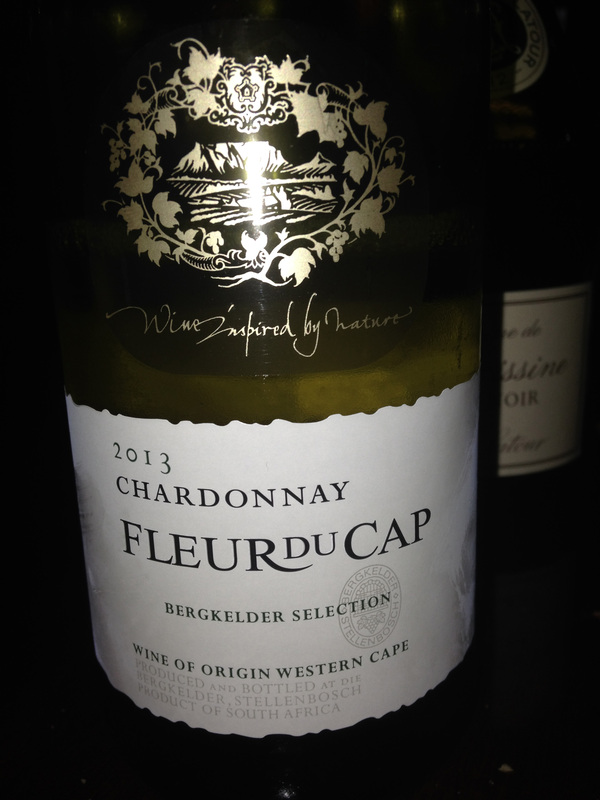 She was having some Fleur du Cap Chardonnay 2013 from Stellenbosch, the Republic of South Africa and it she really liked it, and she has been a fan of Chardonnay from before we met. With my ribs I decided that I wanted a lighter red wine and I saw a Pinot Noir from the firm of Maison Louis Latour and expected a simple Burgundy Red wine. 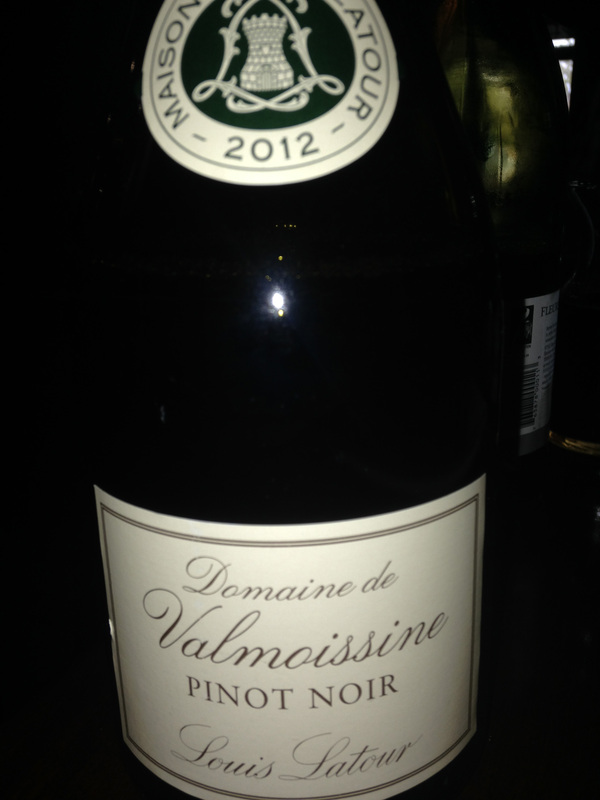 What I ordered was Domaine de Valmoissine Pinot Noir IGP 2012. The IGP stands for Indication Geographique Protégée and is a designation between Vin de Pays and AOC. This wine was from the Coteaux du Verdon in the Southern Coast of France that is picking up in popularity due to the winemaking skills of some firms and the more affordable nature of the wines. I am not sure that I could state in the affirmative in a blind tasting whether the Pinot Noir was from France or California, it still delivered what I wanted for my dinner and I certainly did not need a First Growth with an order of ribs, as I am not that decadent. This entry was posted in Dining, Wine and tagged Chardonnay, Coteaux du Verdon, Domaine de Valmoissine, Fleur du Cap, Italy, Louis Latour, Pinot Grigio, Pinot Noir, South Africa, Stellenbosch, Tolloy, Trentino-Alto Adige. Bookmark the permalink.